This seminar explores how the humanities can contribute to discussions of sustainability. We begin by investigating the contested term itself, paying close attention to critics and activists who deplore the very idea that we should try to sustain our, in their eyes, dystopian present, one marked by environmental catastrophe as well as by an assault on the educational ideals long embodied in the humanities. We then turn to classic humanist texts on utopia, beginning with More’s fictive island of 1517. 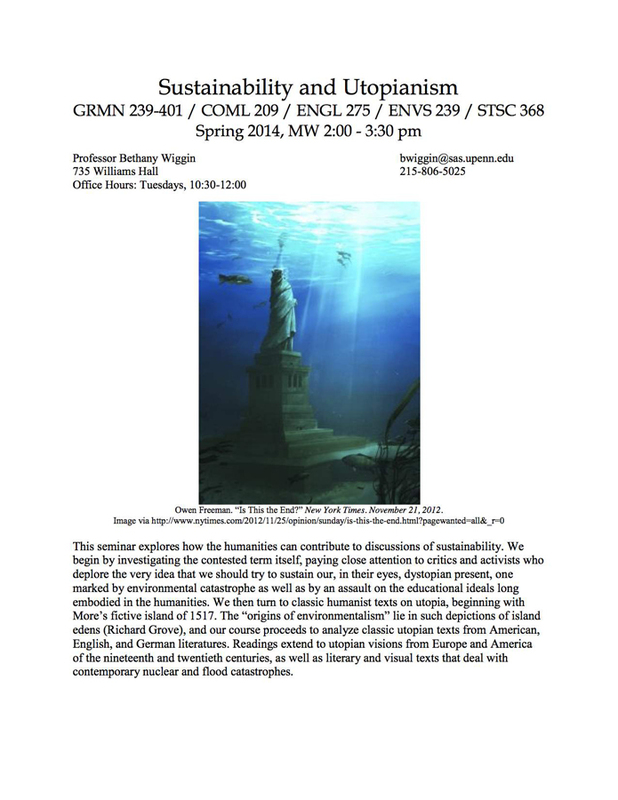 The “origins of environmentalism” lie in such depictions of island edens (Richard Grove), and our course proceeds to analyze classic utopian texts from American, English, and German literatures. Readings extend to utopian visions from Europe and America of the nineteenth and twentieth centuries, as well as literary and visual texts that deal with contemporary nuclear and flood catastrophes. Authors include: Bill McKibben, Jill Kerr Conway, Christopher Newfield, Thomas More, Francis Bacon, Karl Marx, Henry David Thoreau, Robert Owens, William Morris, Charlotte Perkins Gilman, Ayn Rand, Christa Wolf, and others.